Do you support data portability in your digital marketing initiatives? I was recently reading an interesting view on the need for an online data portability policy & the do's and don't for companies and marketeers to publish such a policy. This kind of a policy, I believe, is becoming very important as we leave a lot of personal information online and users like me must have control on the information that can be shared or ones that must remain private. So is the case with consumers who visit a company website or marketing microsites or social websites where they again leave information about themselves( this is just not an unsubscribe policy!). Imagine that you are on a social networking site and their revenue model is targeted advertising. Social networking sites today use this information to link marketers to consumers with similar interests/views - both positive and negative across multiple websites. The economic value of such information is huge and it must be left to each consumer to let such sites enhance the online experience in a customized manner using customized content. One cannot assume everbody wants customization of digital experience and intrusion of such sorts is despicable. With more and more Apps, APIs etc. growing in acceptance and usage, this is a very important step that marketers and companies need to be cognizant of. 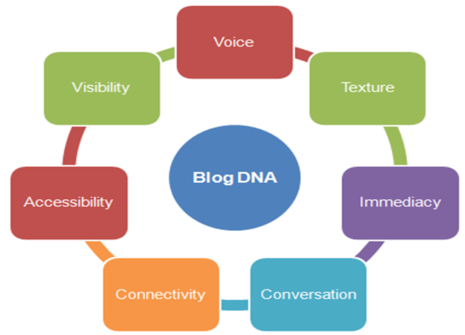 "..we put together this simple graphic that presents the 7 Strands of Blog DNA - the key elements that, when combined in a unique way, make any given blog what it is. Original, compelling and unlike anything else on the web." "One of the best resources for blog content comes out of interactions with prospects and customers. If an organization can tap into the flow of dialog that happens between front line employees such as sales people and customer support there is an abundance of valuable content available. If customers and potential customers have questions about certain topics, then it’s pretty likely that many others will too." Taking-off from this thought, I felt one of the most important areas where such knowledge resides is in the call centre conversations for companies. Many customer service queries get handled during such interactions. Would it not be a good idea to have a section in a company website called FDCs - Frequently Discussed Conversations or even put them in their business blogs? This could be customer conversations on product, service, usage issues, new solutions discovered by customers etc. I think podcasts of the same can be made available on the blog, websites etc. so that customers/prospects can listen to them and bring them closer to the brand & the company. The future of great customer experience is all about converting interactions into information. NY Times has a very interesting article on how enterprises are making Social Networking as a platform to get companies closer to their customers. I really love the extension of the idea to business because social networking was seen more as a "peripheral community" among industry leaders. These sites were seen as a hub of young consumers getting together more as a hobby and sharing amongst themselves common issues and interests. Imagine, if this can become mainstream for enterprises - making it the hub for its customers! I think this is a big idea and inflection point for social networking this year and the future too. Imagine a social networking site for Whirpool where women who have bought their products can share their experiences,recipes, usage problems, service issues etc. in a social networking context. This could lead them to meet new friends, new information about raising children, new usage ideas etc. and Whirlpool will be the catalyst for this community. It could end-up in them sharing photos, holiday information etc. and this community will help Whirlpool design its products and services better for them. Imagine they allow customers to build their own site, invite their friends, look and feel are customized etc. Or a bank where people talk about money and issues wrt money - How to save, how to increase their wealth, investment opportunities, chat on financial services brands, their agents or Financial planners, their concerns and fears about the future of their investments, retirement plans etc. Imagine a banking website having a social networking site that can allow this community to grow and spread on the web, mobile, TV etc. Social networking can become the call centre of the future. The agents are customers themselves! I think this is a great opportunity but companies need to be just the catalyst for such forums. They need to enable, listen, share, collaborate, engage with these customers and prospects if enterprise social networking has to come of age. Recently, I had a written a post about new media getting the attention of marketers. In fact, I had mentioned there that I hated the use of the word non-traditional media and called it convergent media. Looks like radio stations are fast adopting convergent media strategies. NY Times has an interesting article on how radio stations are using their websites to have videos that literally 'extend' the listening experience. Radio Stations can become a visual medium if you have the right imagination! Forrester has released a research report “The ROI Of Blogging: The “Why” And “How” Of External Blog Accountability”. I just saw an interesting promotion on Coke Rewards. There's a nice touch to this promo. If you go back to my post on Faith Popcorn's 2007 trends, it's quite close to the trend and insight -"The globally conscious consumer regards altruistic activities as a necessary part of self- improvement." Coke has truly taken advantage of this trend with this promotion. If you drink Coke you need to start donating those coke codes under the cap to the Donate Your Coke Rewards blog. The site has collected over 1,500 codes and is donating all the prizes from the rewards to a needy St. Jude Children's Research Hospital kid. Is blogging an island without too many inhabitants - Is it a niche waiting to get mainstream? Does the opinion of bloggers matter at all when it comes to brand purchase decisions? Do consumers consider blogs as a trustworthy source vis-a-vis other forms of media? Is user-generated content considered valuable by customers? Is it possible to summarize the business impact of blogs by way of addressable customer numbers? Is it a large enough market waiting to be tapped by marketers? In a keynote speech on Monday, Gartner's director of global research, Peter Sondergaard, warned conference attendees that consumerization will be the most significant trend to have an impact on IT over the next 10 years. "We stand at the foot of a new high tide," Sondergaard said. "There is a shift in technology ownership." Sondergaard argued that consumers already have a great deal of power over how services and technologies are configured and used. The encroachment of Web 2.0 into the business world, sometimes referred to as "Enterprise 2.0," was a common theme running. Mike Sansone of Converstations has included my blog in his list of blog rolls. As you can see, I am in the august company of some of the best blogs in the world. Thanks Mike for your reference and link.